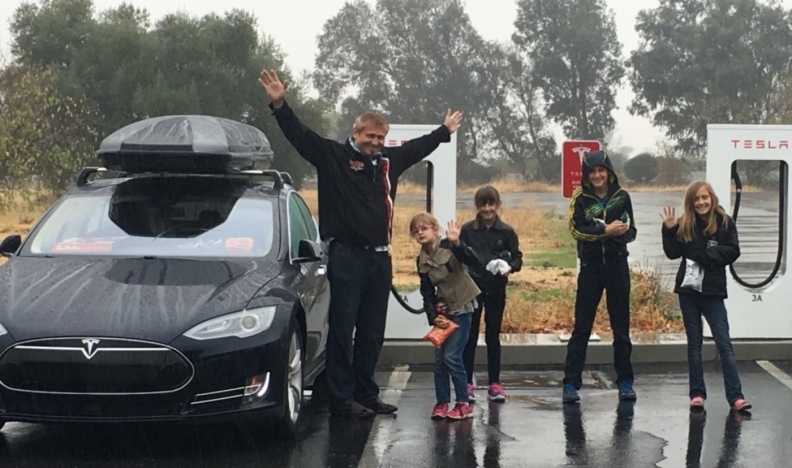 The Subasic family drove their Tesla from Calgary to Anaheim and back — and blogged about it for the automaker. CALGARY -- The introduction of the Tesla Model 3 to Canada is touted by the California company as a game-changer that will bring a dramatic boost to its fortunes here. Whether the mass-market “affordable” electric sedan will break through in Canada remains to be seen, but Tesla is gaining acceptance in areas outside the three provinces that offer incentives to electric vehicle buyers: up to $5,000 in B.C., up to $14,000 in Ontario and $8,000 in Quebec. There are now two official Tesla stores outside that zone, both in Calgary. One is in the Chinook Centre shopping mall that opened two years ago, and a newer sales/service centre that opened July 6 this year. When the Model 3 will come to Canada, and at what cost, is not yet known. Now in production, it is base-priced at US $35,000 (about Cdn $44,600) before extras like any other colour than black (US $1,000), or the semi-autonomous driving system. Nott Autocorp is a high-end Winnipeg used-vehicle dealer that has added previously owned Tesla vehicles to its inventory. There’s no information on where it gets its cars but four models ranging from 2014 to 2016 have been sold there, according to its website. The site also lists two used Teslas for sale on the lot. More than most automakers, secrecy surrounds Tesla’s operations and intentions in Canada. Russ Shaw, Chinook Centre manag er, came to Tesla from Microsoft while sales/service site manager, Christen Rose, comes from a retail background. While expressing a desire to be cooperative with the press, both said they are not authorized to speak about sales, service or anything else to do with the operation of their dealerships. “I am forbidden to represent the company to any kind of media,” said Shaw, while Rose said he’s not allowed to discuss the business. Shaw did say that the service centre handled deliveries for his mall store. Photographs were not allowed to be taken inside either store. Plans for a network of Tesla charging stations across the country are indicated on the company website, which shows a map of available locations, but as it is not dated it is uncertain how current it is. Superchargers (about 20 minutes to charge a battery to 50 per cent capacity, 40 minutes to 80 per cent, 75 minutes to 100 per cent): In British Columbia, 44 with three coming soon. In Alberta, 27 with two coming soon. In Ontario, 61 with 16 coming soon. In Quebec, 38 with 11 coming soon. There are no chargers in Saskatchewan or Manitoba although one is planned for Winnipeg. According to the map, there are none east of Quebec. The automaker has been hard at work installing a fast-charging network, coast to coast in Canada, including parts of Sakatchewan.